In many countries there is a belief that, contrary to expectations, a cemetery only has one ghost within the grounds. The guardian of the graveyard. The role of the guardian is to oversee the cemetery and ensure all is well. To a certain extent it makes sense, while many people perceive cemeteries as spooky places, the vast majority of reported ghost sightings take place elsewhere, most commonly in locations connected with a significant incident in the life of the person. There are various methods to try to identify the grave of the guardian, but in one ancient cemetery that I visited regularly in my youth, the guardian is far more visible (or at least it is based on the story I was told at the time). At the highest point of the cemetery, a statue of an angel holding a cross marks one of the graves. This in itself is not an unusual design of tombstone to have, I have seen them in many cemeteries, but there is something very different about this particular monument. 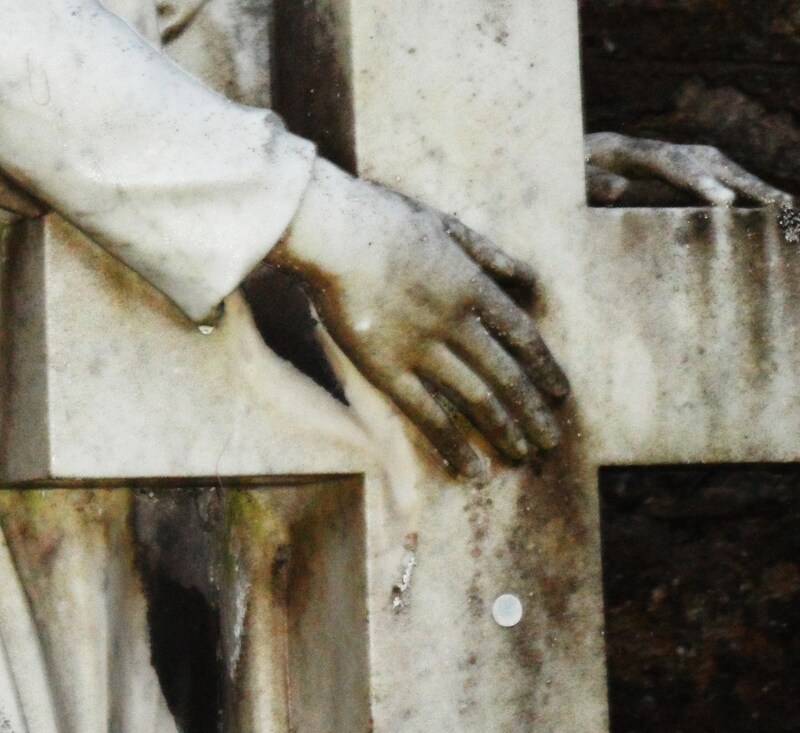 A close examination reveals that the hand on the cross appears to have moved at some point. The stories I have heard vary from an angel being seen moving around the cemetery, to a body being found in the cemetery close to this grave, strangled to death. If you look at the photo below, you can clearly see below the hand the outline as though the hand was once in a lower position with the little finger lower on the cross. Could the story of the guardian be true, or is there a more simple explanation, such as a mistake made by the stonemason that was later rectified (one finger too many?). I am not revealing the location of this cemetery out of respect to the family, as this could be nothing more than a tale to terrify children. It is however still a tale I find curious, and one of my planned projects is to research the history of this cemetery and, in particular, this grave.